Efficient drive systems, idle power loss reductions and the renewable energy sector all require safe, reliable DC solutions and while they cannot replace AC applications across the board, they are definitely growing in importance. 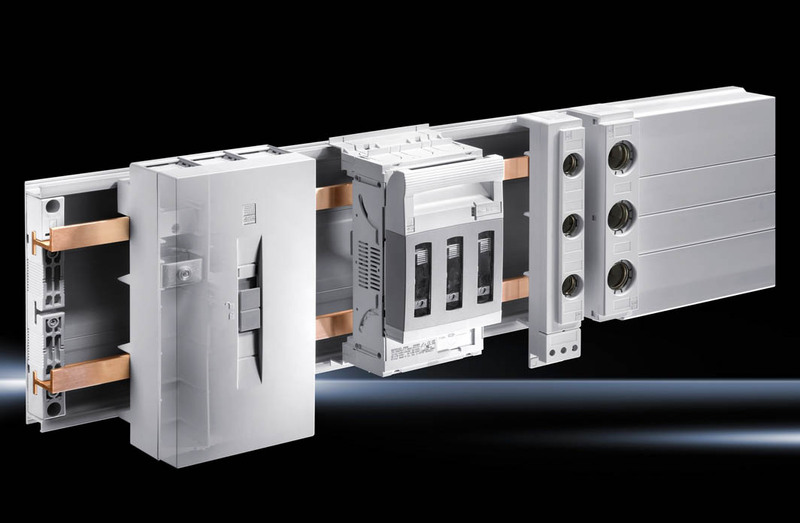 Rittal is the world’s first manufacturer to offer an approved busbar system with standard components, optimised for both AC and DC applications. No other products are required. DC busbar systems are increasingly deployed in converter buses, DC power backup systems, photovoltaics, galvanics, energy storage systems and in shipbuilding. The system has a current carrying capacity of up to 1600A, a nominal voltage of up to 1500V DC and a short-circuit rating of up to 40kA. Rittal’s RiLine is approved to IEC 61439 and UL 845 in conjunction with UL 508, making it suitable for a wide range of industries. Depending on requirements, busbar systems can be made of copper, aluminium or cuponal, a copper-clad aluminium busbar from Rittal. RiLine’s assembly parts, such as connection adapters up to 800A, OM component adaptors with tension spring clamps and CB Series compact circuit breaker adaptors up to 250A, are suitable for DC applications. The following fuse components can be deployed: size 00-3 NH bus-mounting fuse bases up to 630A and size 00 NH slimline fuse-switch disconnectors up to 160A, with corresponding DC fuses. 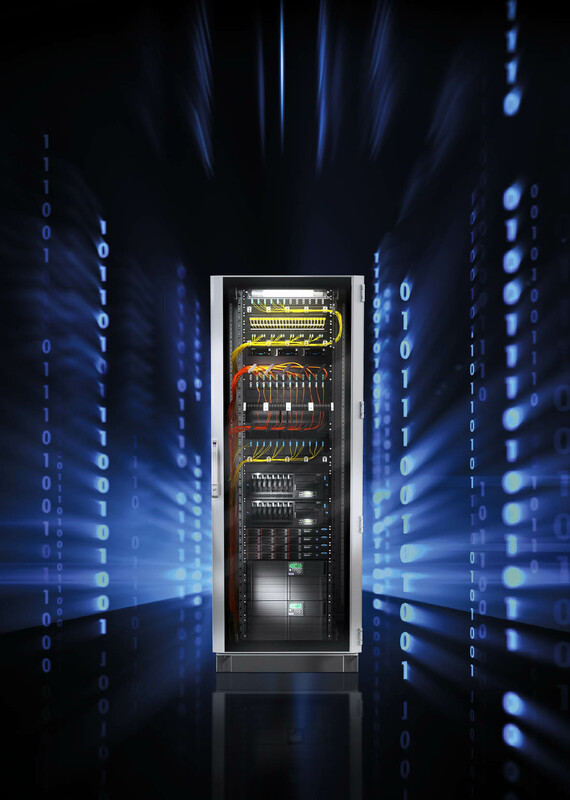 Rittal has expanded its modular TS IT rack to offer more than 100 configurations, providing customers with more options and greater flexibility for their IT enclosures. The enclosure portfolio comprises a wide range of dimensions that can be combined with a choice of interior components. In addition to the original enclosure, which features state-of-the-art snap-in technology and a maximum load capacity of 1,500 kilograms, a compatible 19-inch mounting frame supporting a maximum load of 1,000 kilograms, is now available in a range of sizes. This version of the TS IT rack, is especially suitable for network components, enables greater flexibility in cabling and offers space for copper and fibre-optic cables, Ethernet and Fibre Channel. A configurator, available on Rittal’s website, enables customers to choose exactly the right solution for their needs. The size, door and type of protection can be defined, together with any interior components. The configurator can be found at http://www.rittal.com/de_de/it-configurator/index.php?l=en. Rittal also offers preconfigured enclosures allowing customers to build an enclosure that perfectly meets their needs. They are available via a dedicated order number and can be deployed almost immediately. The rack system comes with two 19-inch mounting levels, single-piece lockable side panels with a 3524 E security lock and brush strips for easy cable management. Glazed aluminium doors feature safety glass, a security lock and an ergonomic handle with a slot for a single cylinder lock. For switchgear with ratings above 1600 amps, Air Circuit Breakers (ACB) and copper connections have to be tested for short circuit and the effects of heat rise. Rittal’s latest RPE software can supply the actual current carry capacity (Inc) of all leading air circuit breaker manufacturers, plus the CAD drawings of the ACB connections required to fit within Rittal’s Ri4Power modular switchgear systems. This software facility will reduce build time and assist the panel builder or designer to comply with the new IEC 61439 switchgear standards. 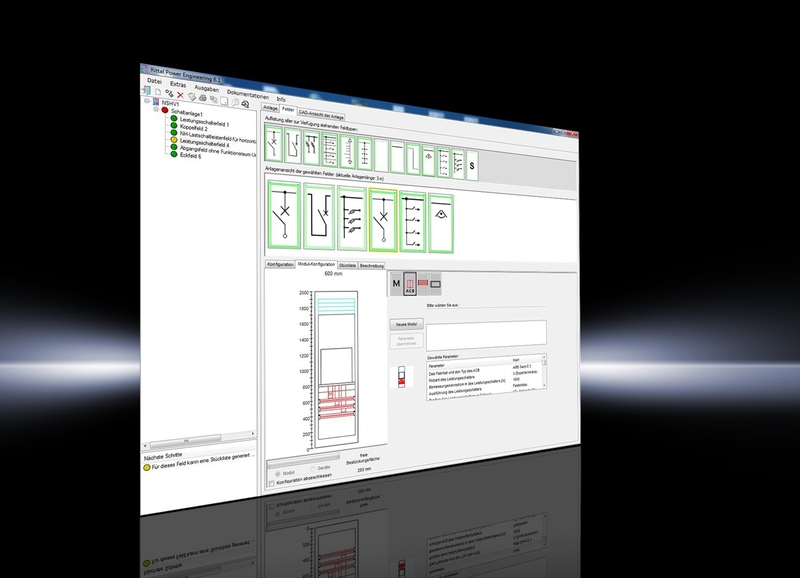 Key features for users of Rittal’s RPE software include generation of copper connection drawings; production of design verification documentation; the ability to generate users own documentation and internal enclosure temperature calculation. A typical ACB connection drawing as generated in the RPE software is shown. Further details on the standards or the RPE software used in conjunction with the Ri4Power modular system are available from Rittal.